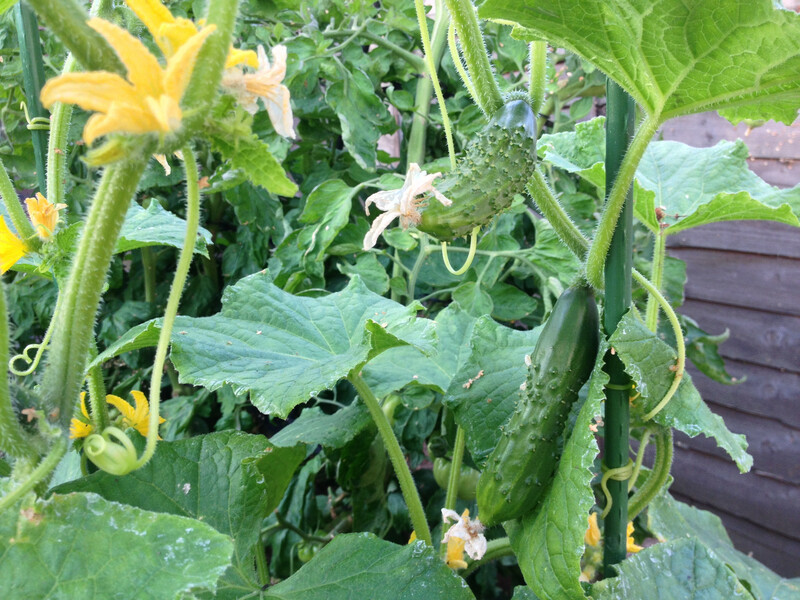 A Wautoma cucumber fruit ready to be picked. 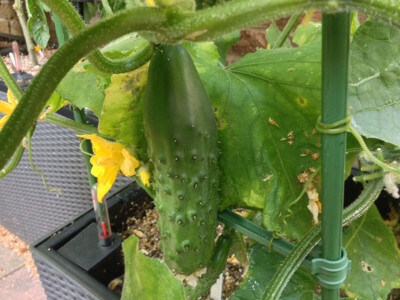 A couple of pollinated Wautoma cucumber fruits. 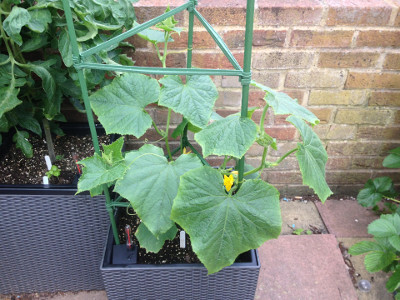 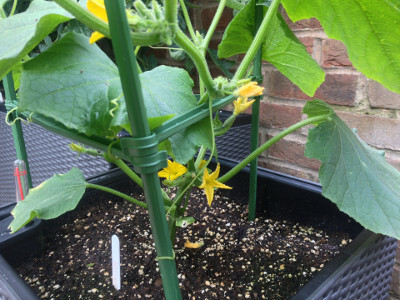 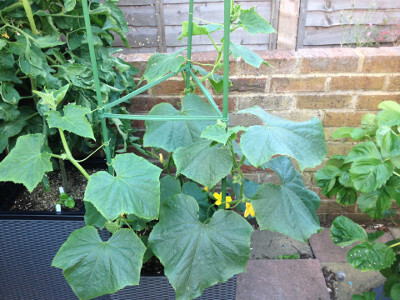 Flowering and fruiting Wautoma cucumber plant with three main stems trained to the top of a tomato cage. 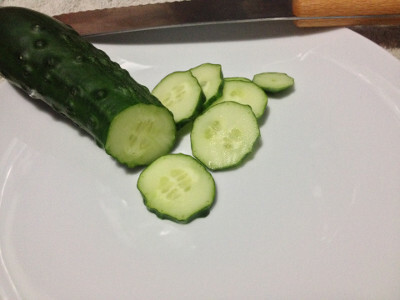 Wautoma cucumber, sliced. 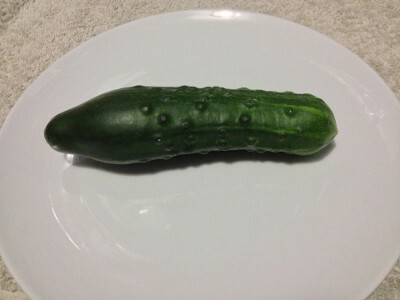 It didn't taste like it had enough water content. My first homegrown cucumber (Wautoma cultivar). 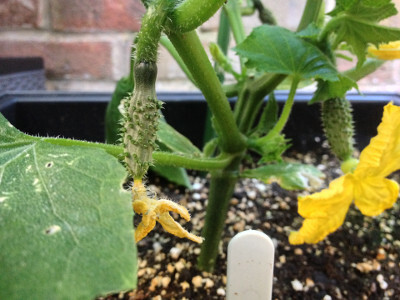 Two female Wautoma cucumber flowers that have hopefully been pollinated by insects. Flowering Wautoma cucumber plant with 3 main stems that are really wanting to grow horizontally instead of up the tomato cage. 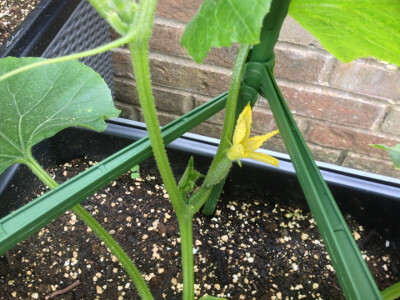 A female flower on a Wautoma cucumber plant, with a growth tip also growing from the node that needs pruning. Hopefully this flower will be pollinated and the fruit behind it will grow into a cucumber. 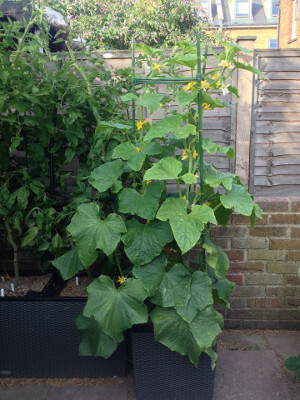 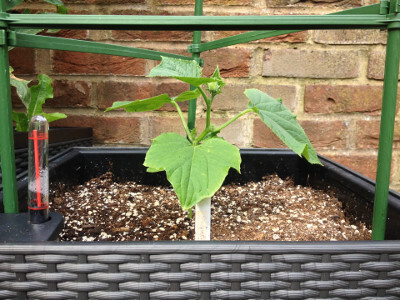 Flowering Wautoma cucumber plant with three main stems being trained up/around a tomato cage. 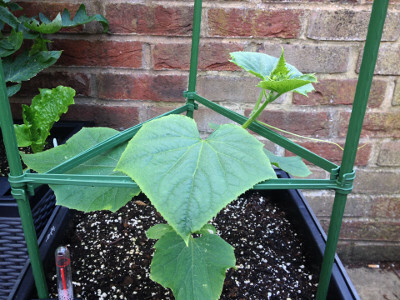 Wautoma cucumber plant with a tendril two nodes below the main growth tip that hasn't yet latched onto the tomato cage. 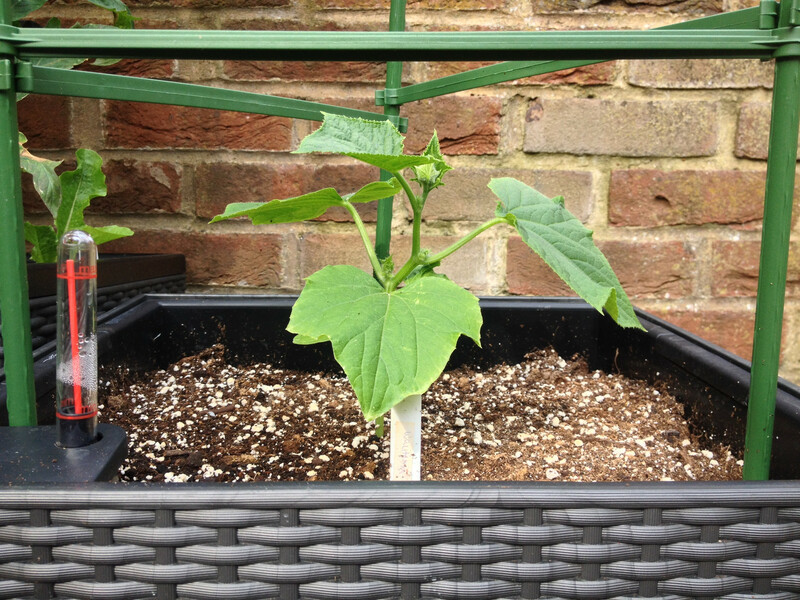 The only Wautoma cucumber seed that germinated has put on some growth since planting out. 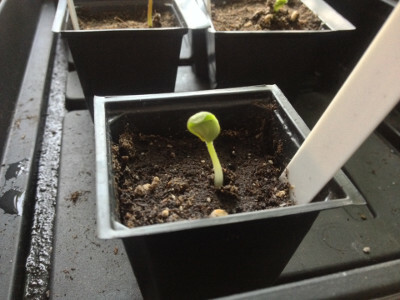 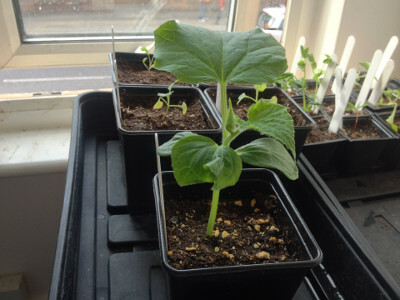 My lone Wautoma cucumber seedling with its second set of true leaves growing. 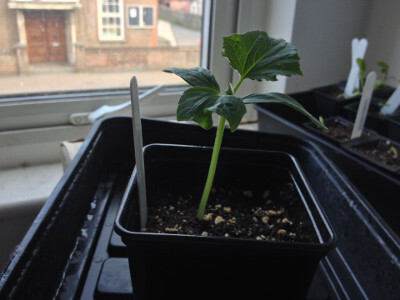 My lone Wautoma cucumber seedling with its first true leaves. The cotyledons of a Wautoma cucumber seed have broken the surface.